Tteok (Korean: 떡) is a class of Korean rice cakes made with steamed flour made of various grains, including glutinous or non-glutinous rice. Steamed flour can also be pounded, shaped, or pan-fried to make tteok. In some case, tteok is pounded from cooked grains. The pronunciation is between a "t" and a "d" sound, ending with -ukk. It could also be written as ttukk, ddukk, dhukk. 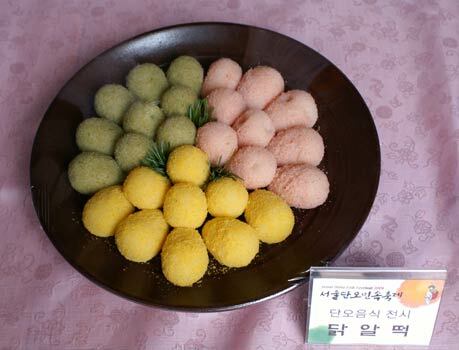 Tteok has been enjoyed not only as desserts or seasonal delicacies, but also as meal. It can range from elaborated versions made of various colors, fragrances, and shapes using nuts, fruits, flowers, and namuls, to plain white rice tteok used in home cooking. Some common ingredients for many kinds of tteok are red bean, soybean, mung bean, mugwort, pumpkin, chestnut, pine nut, jujube, dried fruits, sesame seeds and oil, and honey. Tteok is usually a food that is shared. Tteok offered to spirits are called boktteok ("good fortune rice cake") and shared with neighbours and relatives. It is also one of the celebratory foods in banquets, rites, and various festive events. Tteokguk ("rice cake soup") was shared to celebrate new year and songpyeon was shared on harvest festival. The below are cooking utensils to make tteok in the traditional Korean way. Tteok is largely divided into four categories, such as "steamed tteok" (찌는 떡), "pounded tteok" (치는 떡), "boiled tteok" (삶는 떡) and "pan-fried tteok" (지지는 떡). The steamed tteok is made by steaming rice or glutinous rice flour in "siru" (시루), or a large earthenware steamer, so it is often called "sirutteok" (시루떡). It is regarded as the basic and oldest form of tteok. The pounded tteok is made by using a pounding board or mortar after steamed first. In making pan-fried tteok, the rice dough is flattened like a pancake and pan-fried with vegetable oil. The shaped tteok are made by kneading a dough with hot water which is usually shaped into balls. The main ingredients for steamed tteok or "sirutteok" are rice (맵쌀, maepssal in Korean) or glutinous rice (찹쌀 chapssal) and sometimes they are mixed together. In some cases, other grains, beans (azuki beans or mung beans), sesame seeds, wheat flour, or starch can be mixed with the rice. Various fruits and nuts are used as subsidiary ingredients, such as persimmons, peaches or apricots, chestnuts, walnuts, and pine nuts. In addition, vegetables with flavors or herbs can be used to flavor the tteok. 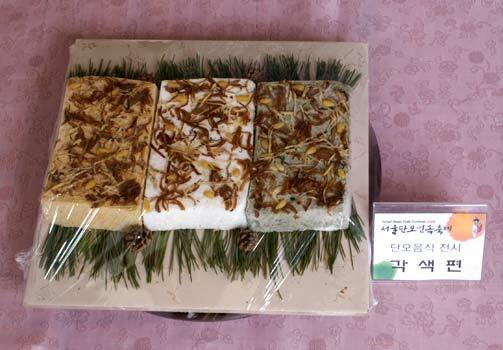 Danggwi leaves (Ostericum grosseserratum), seogi mushroom (manna lichen), radish, artemisia, pepper, and cheongju are the most common flavorings, and honey and sugar are used as sweeteners. In order to make steamed tteok or sirutteok, rice or glutinous rice is soaked in water for a while, then ground. The prepared rice flour is put in a siru and steamed. 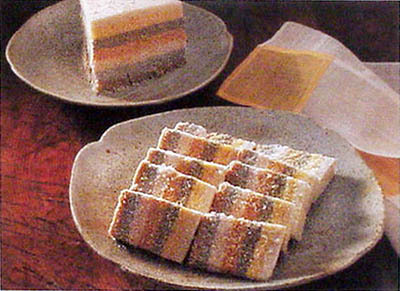 According to steaming method, sirutteok is subdivided into two groups; seolgitteok (설기떡) is shaped into a single large lump whereas kyeotteok (켜떡) consists of multiple layers with azuki bean powder or other bean powder. Seolgitteok is also called muritteok (무리떡), regarded as the most basic form of sirutteok made only with rice. On the hand, in making kyeotteok, rice and glutinous rice are mixed. The name of kyeotteok derives from the adverb kyeokeyo (켜켜, literally "filed") in Korean because the tteok is made as such. Baekseolgi (백설기) - a variety of siru tteok. It literally means white snow tteok which is made of white rice. In the traditional preparation, pounded tteok is made by pounding rice or glutinous rice with utensils called jeolgu and jeolgutgongi or tteokme and anban. Injeolmi (tteok coated with azuki / red bean powder or roasted soybean powder), garaetteok (가래떡 cylinder-shaped white tteok), jeolpyeon (절편 patterned tteok) and danja (단자 glutinous tteok ball coated with bean paste)” are commonly eaten pounded tteok. Rice and glutinous rice are peeled off to make grain particles or powder, and steamed in a siru (earthenware steamer) and then pounded with the untensils. The pounded tteok is divided into glutinous pounded tteok (찹쌀도병 chapssal dobyeong) and non-glutinous pounded tteok (맵쌀도병 mapssal dobyeong) by rice type. Injeolmi that is a representative of the glutinous pounded tteok has varieties in accordance with gomul types (고물, coating made with bean powder, sesame seeds, or sliced jujubes) or subsidiary ingredients mixed into the steamed rice while pounding on the anban. Patinjeolmi (팥인절미), and kkaeinjeolmi (깨인절미) are the examples for the former, coated with red bean powder and sesame respectively. In ssuk injeolmi (쑥인절미) and surichwi injeolmi (수리취인절미) are ssuk (Artemisia princeps var. orientalis) and surichwi (Synurus deltoides (AIT.) NAKAI) added. Garae-tteok (가래떡; also called huin tteok, 흰떡, literally "white tteok") – tteok formed into a long white cylinder. The thinly sliced garae tteok is used for making tteok guk. Gyeongdan - Inside these rice balls are usually red bean or sesame paste. The balls are usually dipped and cover in black sesame or other powders. Bupyeon, consisting of doughs of glutinous rice flour and a sweet filling and covered with gomul, kind of powdered beans. 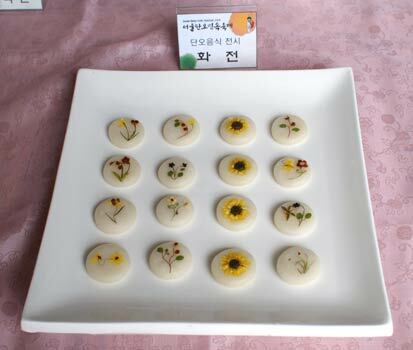 Hwajeon  - small sweet pancakes made of flour of glutinous rice, and flower petals of Korean azalea, chrysanthemum, or rose. Juak (주악), made of glutinous rice flour and stuffed with fillings such as mushrooms, jujubes, and chestnuts, and pan-fried. Juak are colored with natural coloring and covered with sugar or coated in honey. ^ (in Korean) "떡01". Standard Korean Language Dictionary. National Institute of Korean Language. Retrieved 2017-02-24. ^ 떡조리기구 (in Korean). Sujeong Food. Archived from the original on 2005-01-14. ^ a b c d "Ttuk, Hangwa : Kinds of Rice Cakes". Korea Agro-Fisheries Trade Corporation. Archived from the original on 2010-07-04. Retrieved 2008-05-23. ^ "Bukkumi (부꾸미)" (in Korean). Doosan Encyclopedia. Archived from the original on 2009-02-06. Retrieved 2008-05-18. ^ "주악 (juak)". Click Korea Oline Dictionary. Archived from the original on 2011-07-19. Retrieved 2008-05-18. 민족사와 함께해온 '떡' 의 역사 (in Korean). Monthly Chosun. 2006-10-20. Archived from the original on 2006-11-02. Wikimedia Commons has media related to Tteok.